Toronto's Fucked Up return to Detroit this Friday, September 30 at Majestic's Magic Stick. lead his "most perfect name for any band in rock history" as they bring David To Life. Wavves (San Diego) and Mexican Knives (Detroit) open. Yeah, we blew it when we didn't go. But who knew Wolf Parade would announce they were going on indefinite hiatus only four days after they played the Crofoot last November? As fate would have it, we did end up seeing Wolf Parade this summer. Sort of. Well, two members of Wolf Parade, and their personal projects that helped precipitate the WP hiatus: Moonface (Spencer Krug) with Flow Child and Phantasmagoria on Jul. 15 and Handsome Furs (Dan Boeckner and Alexei Perry) with Parlovr on Jul. 30, at PJ's Lager House. Except for Parlovr, all of these artists, either solo acts or duos, rely on a variety of computer-driven electronics for their sound, with quite different results. Flow Child (Montreal) was the most abstract, presenting improvisational compositions reflective of his stage name. Detroit-based Phantasmagoria (Lianna Vanicelli and Christopher Jarvis) easily earned this year's "best band we'd never heard of" nod. Their sound is generally spare, combining both space-odyssey and tribal elements, tempered with appealing vocals, harmony and melodies. They've been playing a lot around Detroit; we definitely recommend checking them out. Spencer Krug's wiki is like reading a who's who of Canadian indie. So it didn't surprise us to discover that the gentleman providing percussion was Mike Bigelow, most recently the bassist with Wintersleep. "I started the tour solo, but it just wasn't working," said Krug. Solo if you don't count the stark white screen at the front of the stage that ran a video for the entire set of a lone, somewhat autistic man (wearing a Detroit Tigers cap!) dancing languidly. "You see, I have a little dude who lives inside me that loves pop music, and he sometimes finds his way into my hands. When this happens, my fingers move toward the catchiest melodies they can, like bees to flowers with the most pollen. It can't be helped. The little pop-dude inside me turns a few notes into a melody and I say, 'Okay, that's nice little dude, a little poppy maybe, but nice, maybe we can use that once, somewhere in the song.' And he says, 'But wouldn't you rather hear it over and over again? Maybe throw it in a few times now, and then a few times again towards the end of the song? And maybe that 'drone' in your left hand would sound better if you moved it up and down the keyboard a little bit.' But then I say, 'Come on little dude, I'm no fool, that's just a chord progression you're trying to get out of me.' Next thing you know we'll be repeating it over and over again, the melody will be a hook, and I'll have made another random half-pop song... It's music played with an organ, organ beats, organ beeps and bloops, and some digital drums. Music based on layers and loops, the hypnotizing sound of a leslie speaker, and the onslaught of melody." Listen. Today is the day. Tune into CBC Radio 3 / Sirius 152 at 8 PM ET ( 5 PM PT) for the Polaris Gala hosted by Grant Lawrence and Damian Abraham. Commentary will be provided by Craig Norris and Vish Khanna. Although we're pretty lucky here in Metro Detroit when it comes to all-Canadian indie stacked shows, it's not uncommon for bands to come through as an opener (Yukon Blonde, Dan Mangan, Suuns, Little Scream). That's the case tonight (Sat., Sep. 17) at the Magic Stick, when Born Gold (the former Gobble Gobble) opens for Washed Out and Deastro. 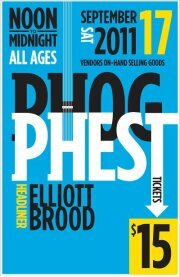 For $15 you could see eight bands at Phog Phest. But if you can't get to Windsor, we think you'll find Born Gold is well worth the price. They're touring in support of their debut LP as Born Gold, Bodysongs. Listen. From our review of their show at the Phog Lounge in April: Gobble Gobble (Edmonton)-- the brainchild of Cecil Frena, with Calvin McElroy, Corin Roddick and Graham Nickle-- took the crowd to a surreal kind of primal-tribal-mystical Roman theater set to experimental, futurist pop. With Frena at the microphone and keyboards/synth and Roddick at the drums, instead of bringing the crowd to the show, McElroy and Nickle brought the show to the crowd. Shirtless, in pink tutus, on drywall stilts, they roamed the room, thrusting strange objects out for people to touch, engaging in a mock battle with shovels. Weird and campy performance art? Sure. But make no mistake, the music is brilliant. Oh! Fest (priced at "pay what you can") kicked off tonight (Fri., Sep. 16) in London, but there's still plenty of music on Saturday (including an after hours show at Call the Office) and Sunday. Scheduled performers include DD/MM/YYYY, Meligrove Band, METZ, Boxer the Horse, Paper Lions, The Danks, The Weather Station, Bruce Peninsula, The Deep Dark Woods, Olenka and the Autumn Lovers, By Divine Right and more. Phog Phest 3 ($15), in the parking lot of Windsor's Phog Lounge. Music begins at 4 p.m. with ASK, and concludes with Grand Analog and Elliott BROOD, with great bands in between. Before heading over to Phog Phest, we'll be catching Hey Rosetta! 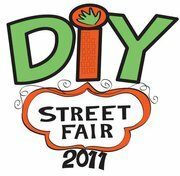 at the DIY Street Fair (free admission) in Ferndale for their 7:20 p.m. set. Hey, we couldn't say no. We Were Lovers offer free single from upcoming album and announce North American tour dates. We Were Lovers' (WWL) dancey beats, swirling atmospheric guitars, and dynamic synths convey a wide array of moods and themes, as strong female vocals wrap stories of love and loss around catchy melodies. Ash Lamothe and Elsa Gebremichael have mastered a pop balance infusing electro, dreamy, rock and disco elements. Known for their high energy live show, this duo's undeniable connection radiates from the stage. WWL will be touring across North America this October / November surrounding their showcase at Halifax Pop Explosion, previewing material from their upcoming album, due in the spring of 2012. Tickets are still available for Phog Phest 3, happening this Sat., Sep. 17 in the parking lot of Canada's Best Live Music Venue, Windsor's Phog Lounge. The $15 ticket price is small for a big lineup, plus if you buy in advance at the Phog, Dr. Disc, Jam Space, or the St. Clair College SRC, you'll be entered to win giveaways from CBC Radio 3, Wellington Brewery and more. See you there! We are NOT booking agents. But, because we've had the distinct pleasure of chatting with and getting to know so many bands, more and more we're being asked: "Where can I play in the Detroit area?" So we decided to get all official and post something we hope will be helpful. Just click on the link above for our new page listing venues and information about them around Metro Detroit that book Canadian indie bands. If we've missed anything-- venues, details we should know about-- just drop us a line at n2ds2w@gmail.com and we'll update our list. Deciding at the last minute to drive five hours round-trip to Call the Office in London, Ont.? That's Fucked Up. Meeting up with fellow R3 bloggers ryanmaksymic and StephRamsahai for the show? That's awesome, not fucked up. Listening to Damian belt out "The Other Shoe" into a dead microphone? That's Fucked Up. Receiving a sweat-drenched hug from a half-naked Damian? That's Fucked Up. Getting your glasses destroyed in a mosh pit? That's Fucked Up. Getting a negligible set of photos because you had to leave the good camera at home so it didn't get destroyed in a mosh pit? That's Fucked Up. Marveling at the stoicism of a band that plays on while audience members crash the stage? That's Fucked Up. Watching Damian give communion to the crowd during "Son, the Father"? That's Fucked Up. Getting a parking ticket because you were so eager to get into the venue you forgot to pay? That's Fucked Up.